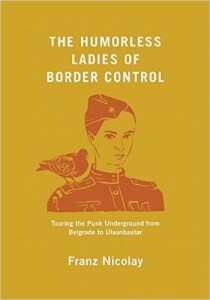 The Humorless Ladies of Border Control: Touring the Punk Underground from Belgrade to Ulaanbaatar is out now on The New Press! I have an essay on Dubravka Ugresic’s American Fictionary in the Spring issue of the Threepenny Review. Hi, here’s the eleventh edition of my dumb little Audio Yearbook, in which I make a mixtape of music that got in my ear this year. In no particular order, best on shuffle. I participated in a roundtable of writer/musicians at Lithub and a speculation about the “New American Songbook” at Slate. I was tickled rosy to return to the Slate Culture Gabfest, this time as musical guest on their Super Secret Getaway live show. Listen here or wherever you get your podcasts. I’ve got an essay in the new Threepenny Review on the once-famous writer and roisterer Gene Fowler in particular, and high-style—ok, purple—prose in general. Bonus Jimmy Durante content. I wrote for Slate about musicians who tour with their children. I like to make an audio yearbook over the course of the year—fiftyish tracks that are a kind of diary of what caught my ear for whatever reason in 2017. Here it is if you’re interested. In no particular order, so I recommend putting it on shuffle. ***NEW MUSIC! *** You can now listen to and/or buy my choral song cycle “PEOPSSONGS,” “squatter madrigals” performed and produced by Anti-Social Music, based on the portrait series by Fly. ***NEW MUSIC! *** You can now listen to and/or buy my score for Alison Chase’s multimedia dance-theatre piece “No Plan B,” which premiered over the summer. I wrote for the LA Review of Books on three recent books about the relationship between popular music and literature. I reviewed Ann Powers’ Good Booty for The New York Times. I created the score for No Plan B, an extraordinary evening-length work of dance theater by choreographer Alison Chase which premieres, in a tent with surround sound and projections, in Fort Knox State Park (Prospect, ME) and Thompson’s Point (Portland, ME) between Aug. 23 and Sept. 2. Read a review (“a one-of-a-kind experience, a thought-provoking journey that jumps with exquisite grace from the meditatively peaceful to the shockingly visceral and back again”), the Portland Phoenix cover story, and other features. I wrote for Slate about the history of the word “sell-out,” and discussed it on the Slate Culture Gabfest. I reviewed Lizzy Goodman’s book Meet Me In The Bathroom: Rebirth and Rock and Roll in New York City 2001-2011 for Slate. I wrote a polemic against graded record reviews for Watt. I talked about The Humorless Ladies with the “New Books in Music” podcast. I finally premiered PEOPSSONGS. It’s been recorded and will appear soon. 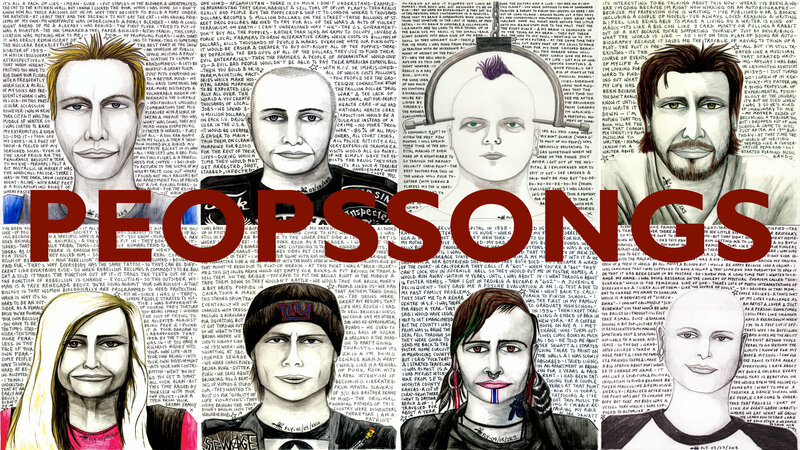 PEOPSSONGS is an a capella, choral song cycle with texts drawn from a series of portraits by the artist Fly, one of the most prominent graphic artists to come out of the Lower East Side squatter scene, documenting LES characters, musicians and artists, and the drifters, visionaries, and charlatans passing through that world. Her longest-running project is a series called “PEOPS“: single-page, head-and-shoulders portraits of the characters and scenesters she’s met, surrounded by transcriptions of her conversations with them during the sitting. A few are well known – John Perry Barlow, Richard Hell, John Zorn (who says “Her visions should be read every morning instead of your daily newspaper”) – but most are simply members of the transient underground. I went through Fly’s PEOPS archive, selected fifteen of the portraits, and edited their words down to provide the texts for the songs. I wrote for The Talkhouse about the new Jens Lekman record, and talked to the Bowie Book Club podcast about Saul Bellow’s Herzog. I appeared on Slate’s The Gist podcast with Mike Pesca, talking “The Humorless Ladies” and more. You can listen here or wherever you get your podcasts. I wrote an op-ed at Cash Music about the inevitable institutionalization of rock. The Hold Steady did a podcast series around the vinyl re-releases of “Almost Killed Me” and “Separation Sunday”–in this episode Craig and I talk about the making of those records.